Front Binding – Welcome to November, friends of the blog! School is beginning to wind down a little, so I am feeling I can squeeze out a post for our final Reader Request for 2012 with little repercussion. 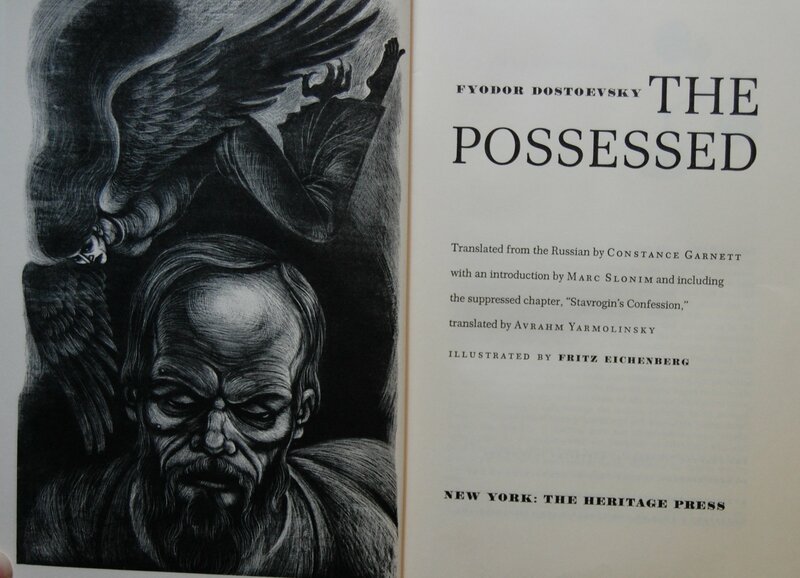 Today is yet another Dostoevsky novel, The Possessed. 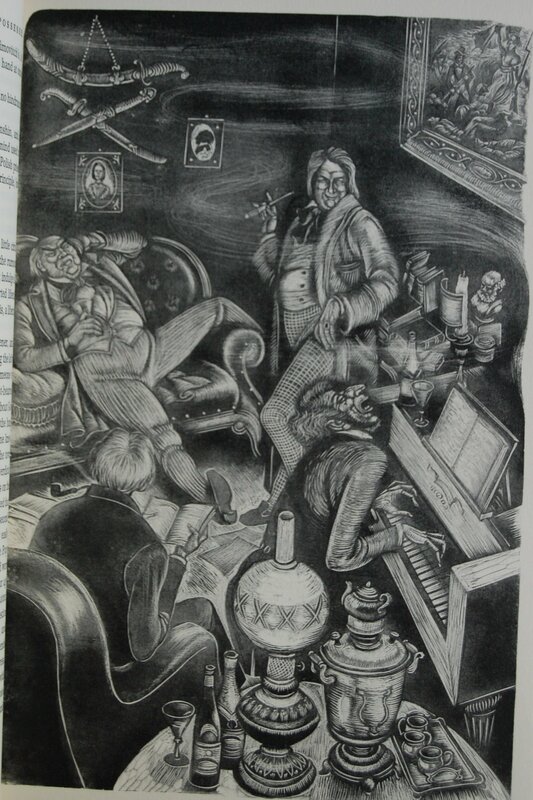 And yes, it’s once again illustrated by Fritz Eichenberg. Even the Sandglass pokes fun at this seemingly perpetual pairing. Both have their publishing careers thoroughly detailed in the last post to see their combined talents, The Brothers Karamazov. 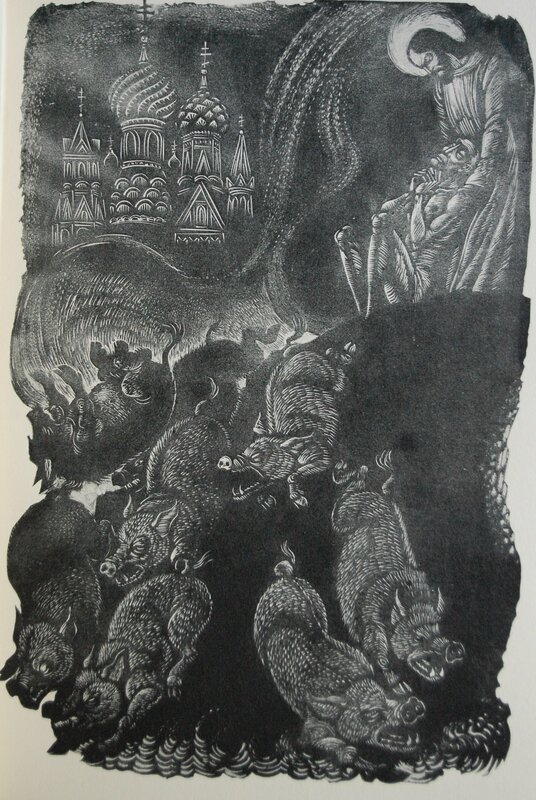 I checked the illustrations above against the ones in my LEC copy and did not see a great difference with the exception of the reproduction of the illustration of the Gadarene swine. Although the bulk of the illustration is a close match for the LEC, the swine in the foreground on the Heritage version are remarkably lighter–indeed, it’s much easier to see the detail of their bristles in the Heritage than in my LEC copy, where the foreground is rather inky. The ground to the right of the swine is also much lighter in the Heritage–in the LEC it is a solid black. The Meriden Gravure Company also did the reproductions of the engravings for the LEC copy, and they have done many other LEC and Heritage volumes. So, perhaps it was a deliberate choice. I guess I prefer a more black-to-white consistency over a slew of grays. As for other production information, Peter Oldenberg served as the designer for this work, and apparently he was at the time a mere fifteen miles away from Mr. Eichenberg’s residence. 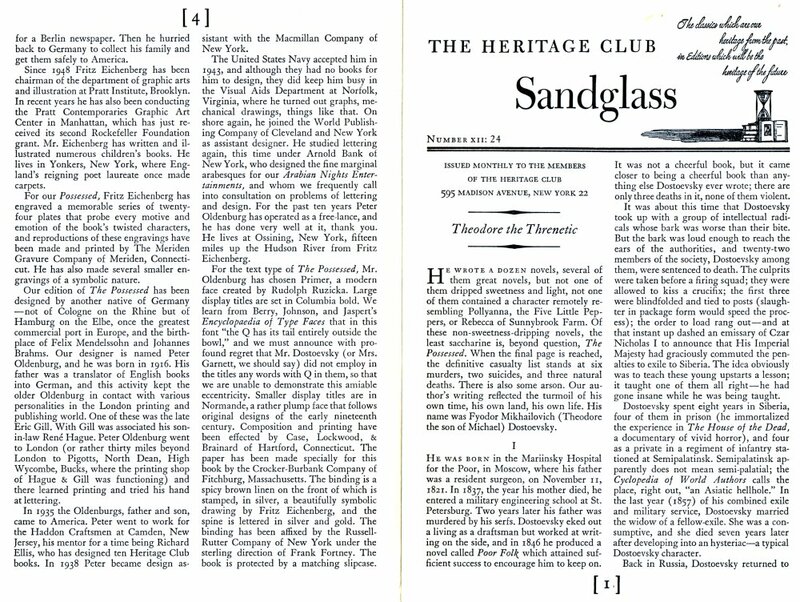 Primer was the font of choice, with bigger titles in Columbia Bold. Smaller titles were rendered in Normande, so font lovers will have three to fawn over in this one. 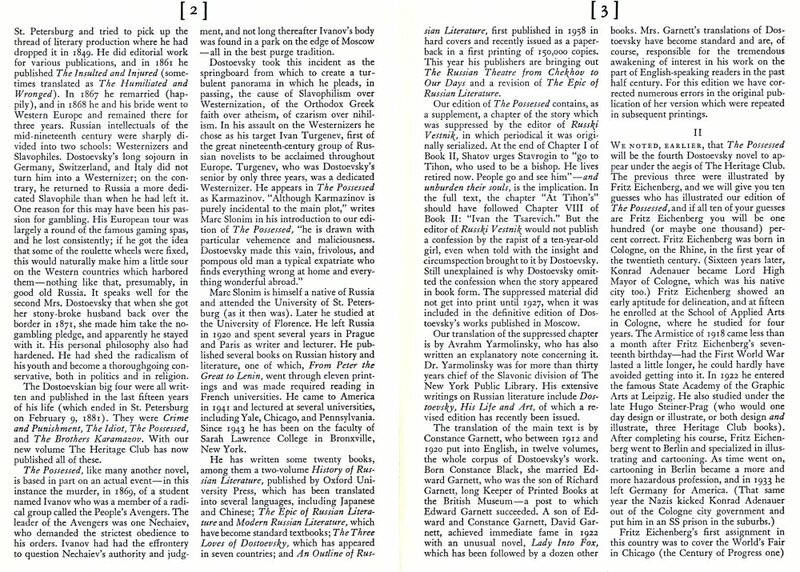 Printing duties were handled by Case, Lockwood and Brainard of Hartford, Connecticut, Russell-Rutter once more bound the book, and its pages were supplied by Crocker-Burbank Company. Title Page – Constance Garnett’s the unsurprising choice for translator, although a suppressed chapter she omitted has been restored to the LEC/Heritage edition, translated by Avrahm Yarmolinsky, who has contributed to the club before for Karamazov and Eugene Onegin. Marc Slonin offers up an introduction. 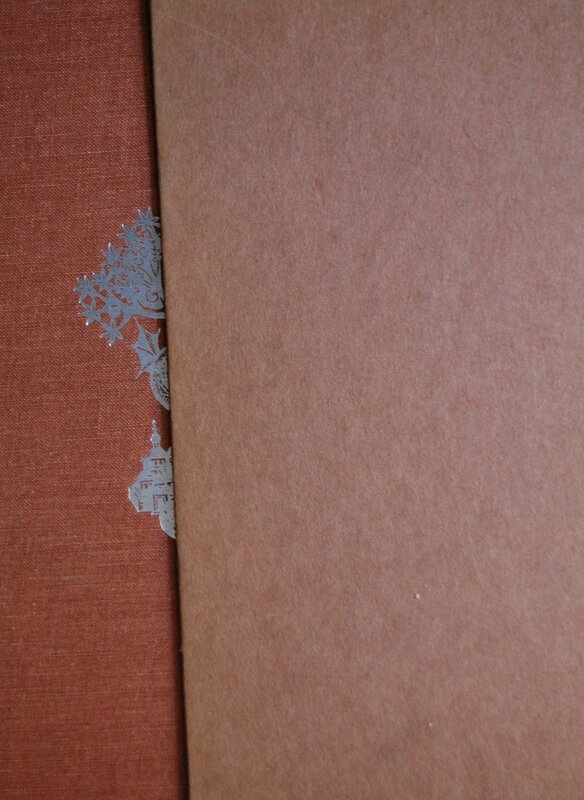 Eichenberg’s art here is relatively well printed, but the two below seem faded or faint to me. Judge for yourselves! Page 26 – Despite my quibbles about the printing, Eichenberg continues to shine artistically. 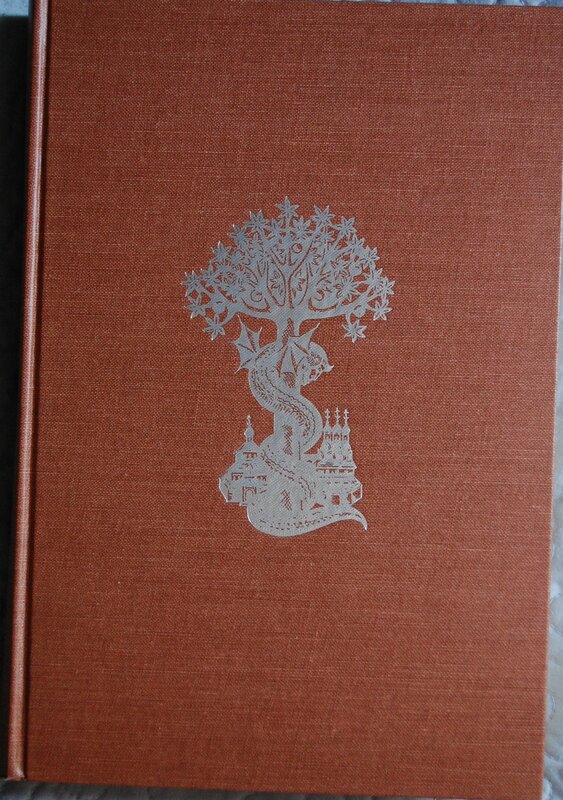 Personal Notes – I got this from Bookhaven in Monterey if my memory serves me well. Yes, that was the “secret shop” I’ve referred to in years past. Alas, they were concluding their business days when I last was in town with no money and no time to go see them, and I will miss them greatly. As I mentioned before, expect a eulogy at some point, as they were a vital source of my overall collection. You are currently viewing the archives for November, 2012 at The George Macy Imagery.